The pledge was made following an order of Deputy Prime Minister Vu Duc Dam to prevent all acts of commercialisation for profit-making in organising festivities, which destroys cultural, historical and spiritual values, according to a recent report of the ministry. The report said the ministry’s inspectorate started intensifying the management of national festivals on Wednesday. These festivals attract a large number of people during and after the Tet (Lunar New Year) holiday. 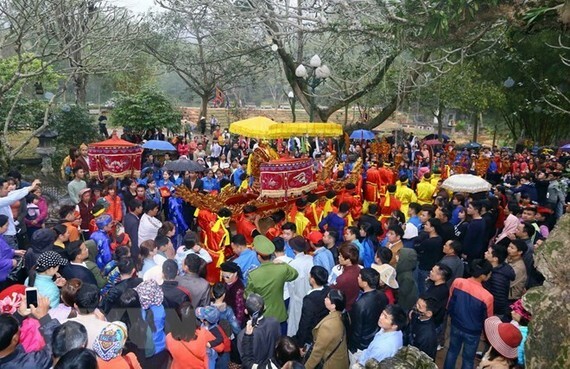 The inspectorate will particularly focus on tourism hotspots, such as Huong Pagoda and Giong Temple in suburban Hanoi's Chuong My and Soc Son districts, as well as the cuop phet festival in the northern province of Phu Tho. Deputy chief inspectorate of the ministry Pham Xuan Phuc said from the cultural point of view, it was difficult to completely control or manage the organisation of festivals but if there were a problem, the authorities should take all measures to gradually solve it, following not only administrative rules but also by using local forces. According to the report, the Ministry of Culture, Sports and Tourism stated during the 2018 festival season that the best solution to improve the management of cultural festivals should be to raise awareness of the cultural and historical values of such festivals, while assigning certain management responsibilities to officials. Hanoi is home to many of the country’s most celebrated festivals. In just the first three months of the year, some 1,200 festivals will be held in the capital. Last year, rumors about robbery and violence spread at some festivals, including the one at Soc Temple. Director of the Hanoi Department of Culture and Sports To Van Dong, assured that no violence or robbery could take place due to strict monitoring and management by the authorities.